The explorer was hit by a poison dart. The player's dart hit the bull's-eye. Lisa and her friends were playing darts. The prisoner made a dart for the door. The cat darted after the mouse. Peter darted a glance at Jane. The Dart or the River Dart is a river in the South West of England. Dart dates back to the early 14th century. The noun came into English from the Anglo-French and Old French dart (a throwing spear or arrow). It came into French from the Old Low Franconian dart, so it is of a Germanic origin, and it can be traced back to the Proto-Germanic darothuz, which also gave us the Old English daroð (daroth), meaning ‘spear or lance,’ which had fallen out of use long before the French influence on the English language. Dart is also related to the Old High German tart and the Old Norse darraþr (darrathr), meaning ‘spear,’ as well as the Spanish and Italian dardo (in the case of these two languages, the Germanic term was adopted from an Old Provençal word). The meaning evolved to mean an even smaller weapon, which can be thrown by hand, as weapons evolved and became more specialized. The game evolved from the weapons. It is thought that archers used to train with small darts indoors when the weather did not allow them to train outdoors with a bow, and they eventually made a game of it. 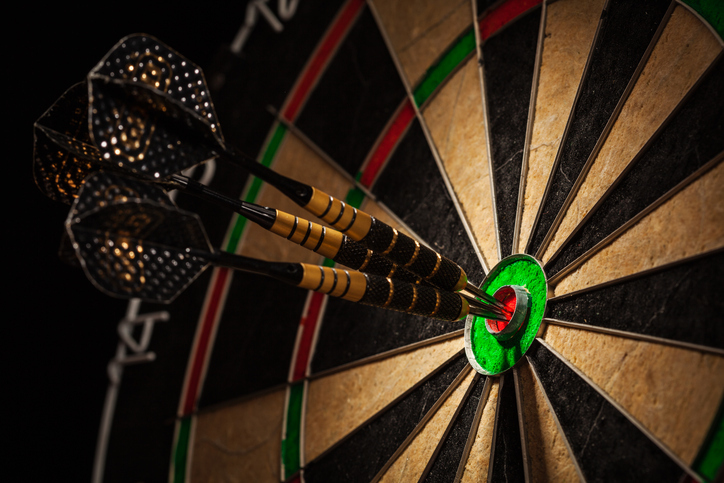 The verb comes from the noun and, originally meaning ‘to pierce with a dart,’ dates back to the late 14th century. The sense ‘to move like a dart’ appeared in the early 17th century, and overtook the original meaning, rendering it obsolete.